Samsung bets that you'll take massive battery life and tolerate good-enough performance for web browsing and office work. Give Samsung credit: the Galaxy Book 2 boldly breaks from the first-generation Galaxy Book on both the inside and outside. The company’s new 2-in-1 not only ditches its flimsy folding keyboard in favor of a more traditional tablet kickstand, but also joins the small ranks of PCs that have adopted a battery-sipping Qualcomm Snapdragon microprocessor. Performance suffers drastically, however, even as battery life soars to an unprecedented 18 hours. The Galaxy Book 2 boasts Samsung’s terrific AMOLED displays and rich sound, with LTE capability, a pen and a keyboard, all sold for a reasonable $999. Remove non-product link In addition to the CPU switch, though, the second generation makes some compromises. The built-in 4GB of memory and 128GB of storage is a bit skimpy, for instance, and the OS—Windows 10 Home in S Mode—might turn some off. 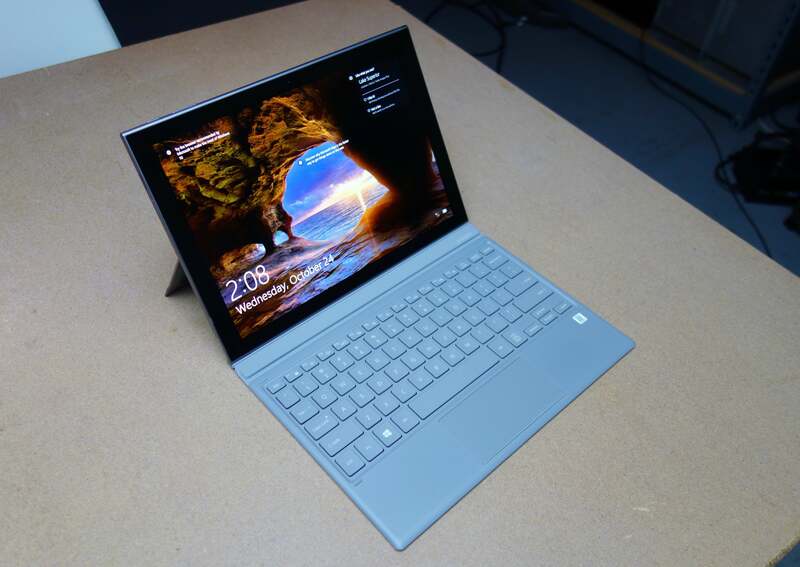 For basic work on the road, the Galaxy Book 2 offers some compelling arguments. But the experience is still too bumpy to recommend to everyone. The Samsung Galaxy Book 2, tuned by AKG. Physically, the Galaxy Book demonstrates that changing horses midstream sometimes necessitates a new harness and tack. 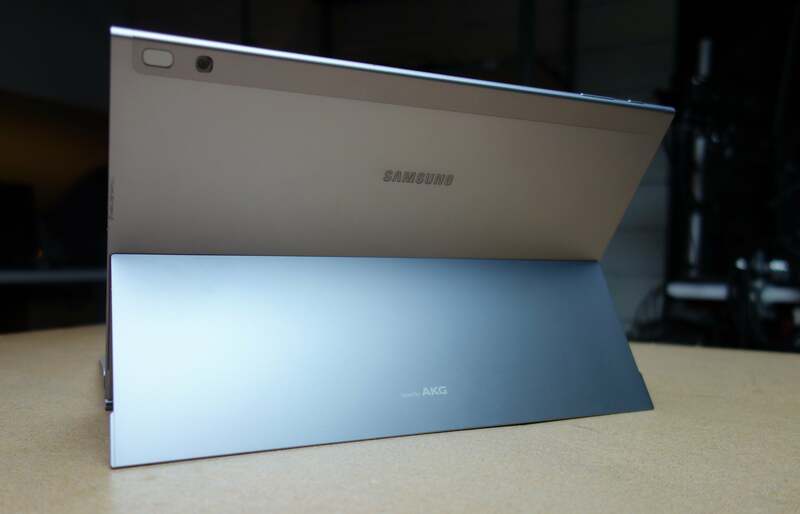 The Galaxy Book 2 is a tad shorter, a bit wider, slightly thicker, and 0.08 pounds lighter than its predecessor. 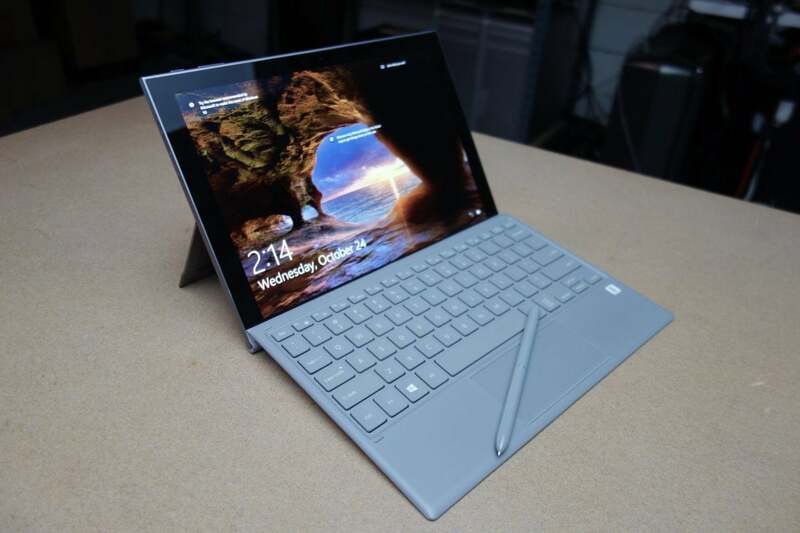 More importantly, it’s now built like a traditional tablet, with a kickstand that nearly fully reclines, like a Microsoft Surface Pro 6. Adios, folding keyboard. The first-generation Book sported a chunky bezel surrounding the screen, and I was hoping for something a bit leaner this time around. No luck. Fortunately, if you’ve seen a Samsung display before, you know what you get: deep, dark blacks and rich colors—though maybe not as rich or color-accurate as the displays on Microsoft’s Surface Pro 6. The AMOLED touchscreen display pumps out a comfortable 329 nits of luminance, which will work well indoors and out. While the tablet isn’t totally sealed—a couple of vents on either side seem like some sort of new, strange expansion port—it is fanless. As for real expansion ports, Samsung leapt ahead to USB-C with the first Galaxy Book, and the second Galaxy Book 2 also sports a pair of USB-C ports. 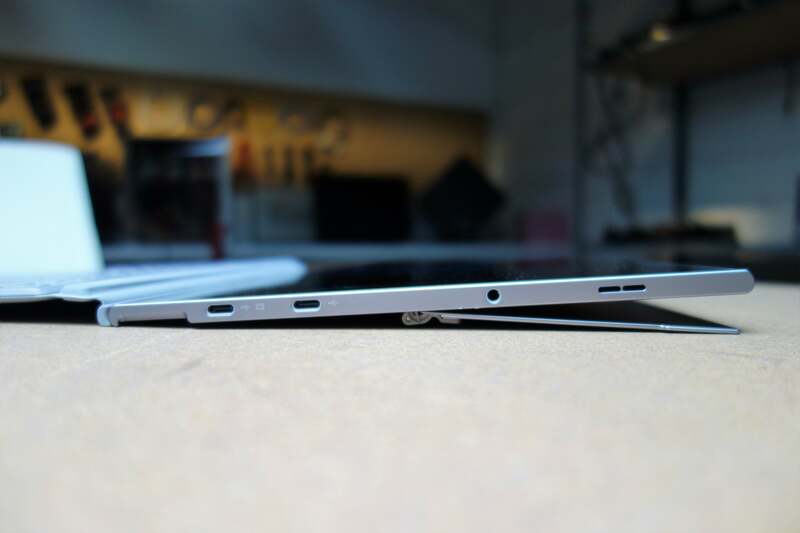 Unfortunately, Samsung wasn’t as thoughtful as, say, the Huawei Matebook: You’ll have to supply your own USB-A adapter if you want to connect to legacy devices. High-speed Thunderbolt connections aren’t available, either. Keep in mind that the LTE slot also doubles as a microSD holder, though adding or subtracting either a SIM or microSD card requires one of those annoying smartphone poky SIM tools to slide the drawer out. 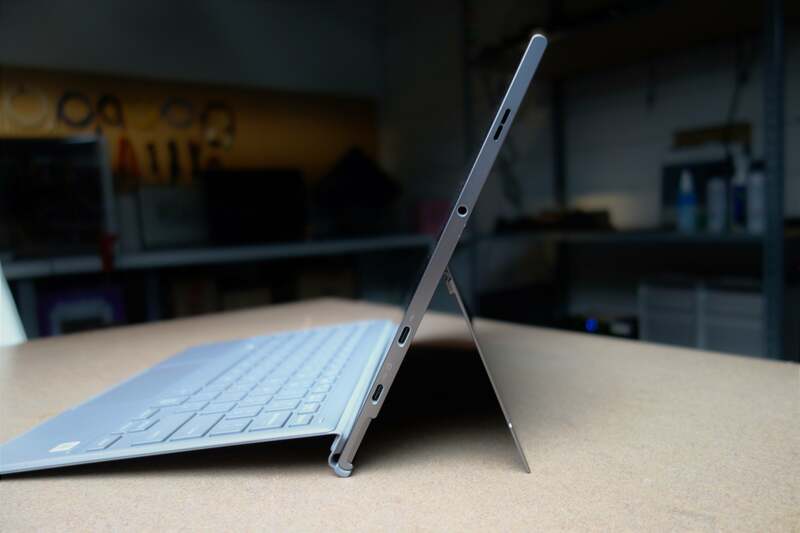 ...even as the Galaxy Book 2 fully reclines. 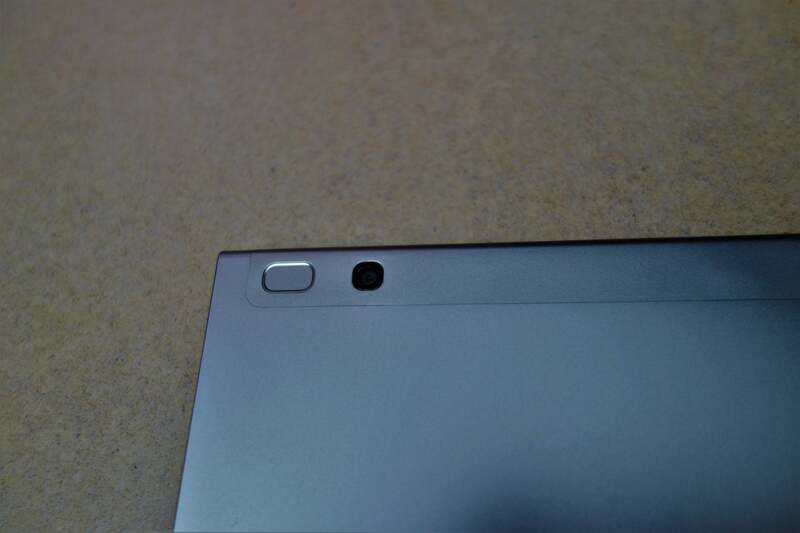 There’s no Windows Hello-certified depth camera, though there’s a fingerprint reader on the rear of the tablet, right next to the camera. It seemed to have some problems reading my finger during setup, and I’m not sure of the advisability of placing a fingerprint sensor next to a camera lens, which could be easily smudged. Otherwise, though, it works acceptably. Using the fingerprint reader requires reaching around blindly to swipe your finger. As for LTE, it’s clearly one of the reasons for buying a device like the Galaxy Book 2. If you want to be always connected (and who doesn’t?) a tablet like this will do the trick. A Verizon SIM was provided for review. I don’t have a Verizon-powered smartphone for comparing reception, but the Book 2 seemed to pick up a signal everywhere a T-Mobile phone could, and then some. Remember that you’ll be able to buy a Galaxy Book 2 from a Sprint, AT&T, or Verizon store, but you’ll have to pay extra for a connection plan. As noted elsewhere, though, Windows prioritized the LTE connection over my Wi-Fi connection. That’s a problem for two reasons: First, not all cellular plans are unlimited; and a cellular connection was (fortunately) listed as “metered” by Windows. While that prevents multi-gigabyte updates from being downloaded, unnoticed, over your cellular connection, it also means that updates and OneDrive syncing can’t take place without manual approval. Finally, don’t forget that the Samsung Galaxy Book 2 ships with Windows 10 in S Mode, which restricts apps to what’s provided in the Microsoft Store. Do you prefer Google’s Chrome browser? Sorry! Remember, switching from S Mode to the full-fledged Windows 10 Home is a pretty simple experience, and shouldn’t cost you anything. It’s a one-way switch, though. The real problem is that we still ran into applications—specifically two of our benchmark applications—that flatly refused to run on our Galaxy Book 2, because of the way they were coded. That’s a risk you’ll have to take. What about that keyboard? Keep reading to find out. Samsung's latest 2-in-1 now looks much like the competition, but with a key change: it uses Qualcomm's latest Snapdragon processor, which delivers game-changing battery life but anemic performance.